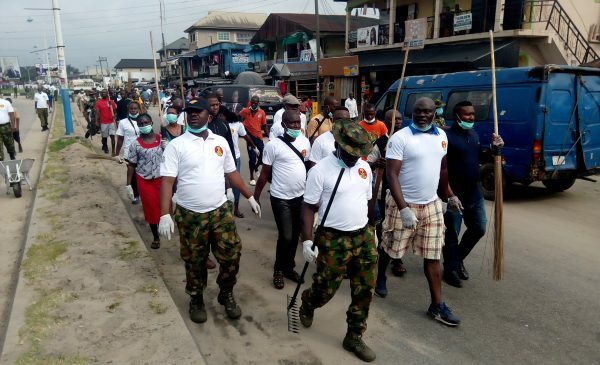 Operation Crocodile Smile, III, drafted by the Nigeria army to the Niger-Delta region, have donated environmental sanitation materials to market women in Ughelli North and South Local Government Areas of Delta state. Items donated are to the market women are, wheelbarrows, Shovels, Cutlasses and Brooms. Speaking while on sanitation exercise in Ughelli main Market, the army held that, “We came here to carry out this sanitation exercise to keep our markets clean because cleanliness is next to godliness and we will present sanitation materials to the market women in helping them to keep their surroundings clean during marketing periods. 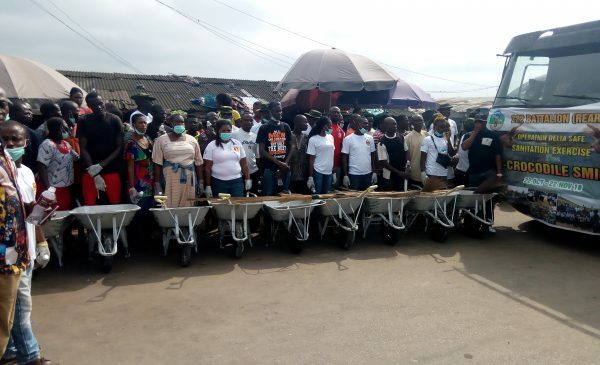 “We want the Ughelli market to be the cleanness not only Delta but in Nigeria they emphasized and we are donating this equipment on behalf the Commanding Officer of 222 Battalion, to ensure that this your environment is cleaned. Receiving the items on behalf the market leaders, chairman of Ughelli North, Hon Godwin Adode, who expressed gratitude to the Nigeria Army for their kind gestures said, “The items donated will go a long way to help in keeping the Ughelli market clean”. 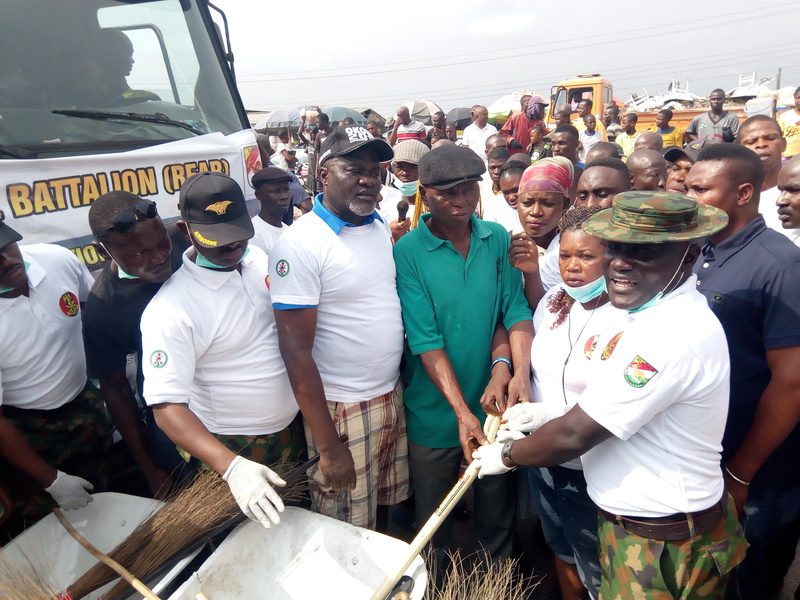 Adode promised to monitor the usage of the donated materials and will work in partnership with Nigeria Army to bring cleanliness to the entire local government and would keep them (Nigeria Army) up to date. The local government boss charged both leaders of the community and market to work in synergy and keep the market and their environment clean always and the items should keep in the market for proper usage. Nobody should take them home for personal usage, Adode warned. Also speaking, Mr. Oghereokwho Jacob, chairman of Ughelli market said, “I appreciate the effort of the Nigeria Army for this special exercise and I want you to continue with it. The market was very rowdy and dirty before now but with this donation we do our best to always keep it clean. Women leader of the market Ochuko Umukoro who spoke on the same vein held that she was very happy to be called upon to come out and work to clean the market. I took it upon myself because the market was very dirty before now. She promised that the exercise will be a weekly one and every trader in the market will participate without any hitches. In Ughelli South, the local government chairman, Dr. Richard kofi express joy over the exercise. He said, this is in line with the smart agenda of Governor Ifeanyi Okowa and the council will partner the military for progress.